This is one of the most used plays in spread option offenses. The QB has an option to hand it off to the RB (no 2) for an inside run to the 5 gap (25 run blast). 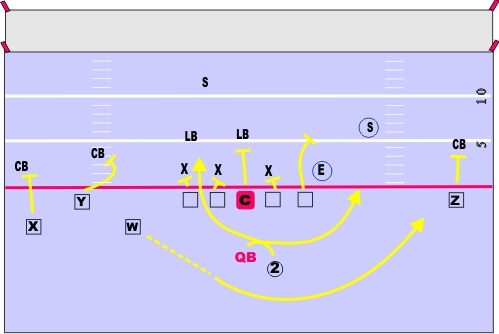 Or the QB can fake the hand off, read the end on the right side and decide to keep it for a QB run to the 8 gap. He can then flip it to the WR if they get on him. The WR goes in motion before the play begins, which will confuse the linebackers and defense and make them hesitate slightly. 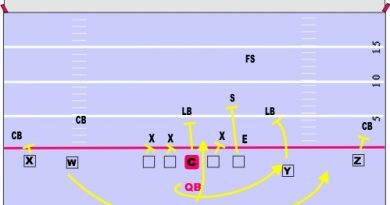 The QB should hold the ball in the belly of the RB long enough to read the end and decide if he is going to pull it out and run, or give it inside for the 25 blast.